18.As an open-minded person, Indahwati becomes friends with many nurses and doctors. Knowing that one of her doctor friend, Prof. Peng Xiaochi(middle), would also show up on the Pink Ribbon Campaign, they specially took a photo together. So far, 6 years has passed, there is no sign of recurrence. We sincerely wish Indahwati a healthy and happy life, besides, we also wish other cancer patients a strong and optimistic mind to defeat cancer like Indahwati. 1.Indahwati Iwan, a 71-year-old woman who has been survived for 6 years since being diagnosed with breast cancer in 2011. Her life is back to normal after receiving comprehensive treatments. During the past 6 years, her husband always accompanies her no matter what she does. The most soulful confession is companionship, their love never changes though they have been married each other for 50 years. 2.Indahwati was accidentally diagnosed with stage II breast cancer because of diarrhea in Nov. 2011. She had radical mastectomy and interventional therapy soon afterwards, and was discharged from hospital three months later. During her hospitalization, her husband has always been there for her, looked after her and gave her courage to fight against cancer. 4.In Aug. 2013, Indahwati was honored as one of the Anticancer Warriors of our hospital on account of her optimistic and strong anticancer spirit. Mr, Tu Xiaoming, the general manger of our hospital, is presenting the award. 5.July 31, 2014, was the 50th anniversary of their marriage, our staff specially planned a golden wedding ceremony to in honor of their love. During the past 50 years, they went through sorrow and joy hand in hand. 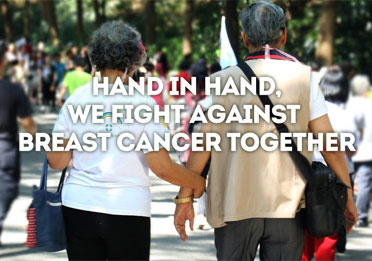 Fighting against cancer is hard but they always in each other’s company. 6.On the golden wedding ceremony(July 31,2014), their happy moment was eternally fixed by the camera. “Very grateful to Modern Cancer Hospital Guangzhou, this ceremony will be regard as one of our most unforgettable memories.” they said happily. 7.Married for 50 years, Iwan Nata Widjaya shared their secret of love and happiness:“Mutual trust, encourage, understanding, tolerance and patient.” Here is the wedding picture of Iwan Nata Widjaya and Indahwati. 8.Indahwati has a happy family, it’s families’ care and support that give her confidence and courage to fight against cancer. Above is her family photo. 9.On the first ASEAN Academic Forum on Minimally Invasive Therapy for Tumor Treatment(April 2015), Indahwati showed up as an anticancer warrior to share anticancer experience and spread positive energy. 10.On the 10th anniversary ceremony of our hospital(Oct. 2015), Indahwati was honored as the “Annual Anticancer Warrior” again. 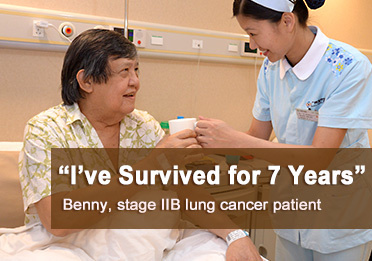 Indahwati is sharing her anticancer experience, hoping to spread hope to more cancer patients. 11.On Oct. 2015, Indahwati became our hospital’s Anticancer Warrior in Indonesia, President Mr. Wang Huaizhong is presenting the offer. 12.Indahwati Iwan and Iwan Nata Widjaya are feeding each other a bite of cake. 13.Along with cancer friends that respectively from Indonesia, Vietnam, Malaysia, the Philippines and other different countries, Indahwati and her husband climbed up the Canton Tower that has the highest ferris wheel. 14.With the theme of “The Road of Rebirth”, a mountain climbing activity was held on Oct. 2015. Indahwati and her husband, as well as other 50 cancer patients climbed up Baiyun Mountain together. Travel is one of Indahwati’s favorite habit, they have traveled many Chinese scenic spots and historic sites in their spare time. 15.A get-together between anticancer warriors and Baiyun Mountain Chorus was held on October, 2015. Indahwati and her husband are singing a traditional Indonesian song with affectionateness. 16.On Oct. 2016, Indahwati participated in the Semarang Pink Ribbon Campaign in the company of her husband. No matter what Indahwati does, her husband always be there with her. 17.On Nov. 2016, Indahwati took part in a Pink Ribbon Campaign in Surabaya with several breast cancer patients, hoping to appeal to more women to pay attention to breast cancer prevention. Above is the group photo of Indahwati, Indonesian Publicity Ambassador of Cancer Prevention and Treatment Melani Hapsari (first from left), Anticancer Warrior VENNY NYOTOWIJOYO(middle).